New composite front door in Giltbrook Nottingham. Our installation team fitted this highly secure composite front door for a customer in Giltbrook. The team also installed all of the interior doors at this property refurbishment. 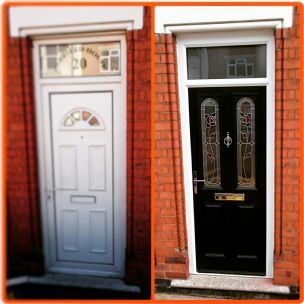 If you would like a quotation for a front door in Giltbrook or any other area of Nottingham feel free to drop us a call on 01157401740. The front door of this property was a low quality uPVC door from the 80s or 90s. The rubber seals were starting to degrade and come away from the frame work and water was getting in to the property as this old door had started to leak. After designing a new GRP Composite door on our designer, this customer chose to have a black 2 panel 2 arch design with our English Rose coloured and leaded double glazed units. They also chose to have a reduced threshold on this door, meaning the frame at the bottom of the opening is lower down to avoid the trip hazard. This customer also chose to have all of there interior doors upgraded too. We removed some old light weight moulded interior doors and replaced them with our more substantial solid oak mexicana doors using both the solid style on bedrooms and bathrooms and so on, and our glazed mexicana on walk ways such as between the living room and dining room. This door installation and renovation was carried out in a village called Giltbrook which is in the Broxtowe area of Nottinghamshire in the East Midlands.